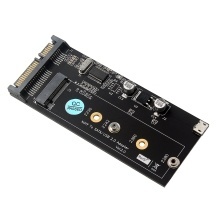 NGFF to SATA/USB2.0 adapter card supports B-KEY SATA NGFF SSD tp SATA or USB2.0. Support B KEY M.2 NGFF interface 22*30 m 22*42mm 22*60m SSD Solid State Drives. One 7+9PIN connector and one B-key SATA M.2 connector. Allow the SSD be used as a system disk. It can boot the operation system directly.